Which of these guitar teaching problems do you need help with RIGHT NOW? You struggle financially from not being able to attract LOTS of new guitar students all year long. You have few or no REALLY GREAT students whom you have taught to become amazing guitar players in your guitar lessons. You are unable to keep most of your guitar students in lessons for more than 1 year. Competition in your area from other guitar teachers offering lessons is making it hard for you to grow your guitar teaching business. The reason you struggle from some or all of these things is because you don't know exactly what to do to change things. You don't yet have a clear path to follow - no real and actionable steps to take to reach the success you want as a guitar teacher. Copying what other local guitar teachers in your area do will never get you to where you want to be… you need something better - way better. People teaching guitar lessons from all over the world tell me all sorts of reasons (excuses really) about why they can't consistently find, attract and keep a lot of new guitar students. They go on and on about why they think they can't earn a lot of money (6-figures or more per year) teaching guitar lessons, why they can't work less and earn more, why they can't consistently get their students to become great musicians, etc. B. You have to 'actually do it'. That's it. Just those two things. I can hear you thinking, "Hmmm… if it only takes 2 simple things, then why do so few guitar teachers become successful?" That answer is also incredibly simple. Here it is: The overwhelming majority of guitar teachers never even try to find out 'how to become a successful guitar teacher'. What the proof? Go to google's keyword search tool to find out how many people on planet Earth are searching for "how to become a successful guitar teacher" on Google. The answer is 'ZERO'! I can't make this stuff up, you can verify it all yourself. So now you know the first reason why more than 99% of guitar teachers never become highly successful… they don't seek out the help they so desperately need - they continue with mediocre results, earning mediocre money and giving their students mediocre results.. The second reason guitar teachers don't become successful is that most won't 'actually do' what needs to be done - even if the steps they need to take are pretty easy and simple. If they get stuck on something, they give up (or worse, they assume it 'doesn't work') instead of seeking out someone who has already achieved what they want to achieve and getting the help they need. "Guitar students in my area aren't serious about learning and practicing their lessons". Every single one of those 'excuses' are wrong, irrelevant and … simply an 'excuse' for not learning what to do and then making a real effort to actually do it. 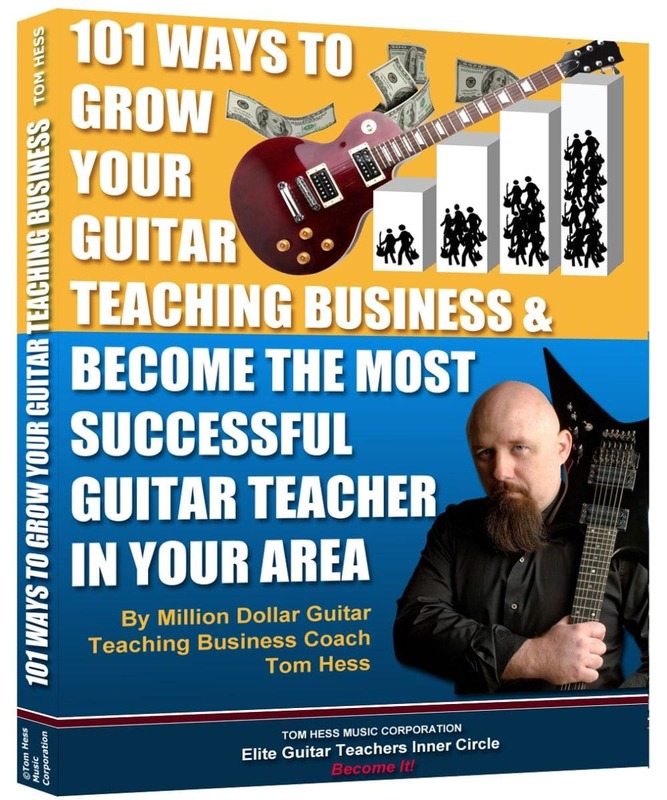 So, if you don't want to be one of the 99% of guitar teachers who are too lazy, too pessimistic or just too plain dumb to do something about it, then this is your chance to finally become truly successful, earn a lot of money, teach guitar part time and make an incredible positive difference in the lives of the students you will teach. Here's the deal: I'm going to reveal to you exactly what to do to become highly successful for a single dollar - NO STRINGS ATTACHED!. Helping your prospects realize that YOU are the best and only logical guitar teacher for them. Keeping your students addicted to ‘wanting’ to study with you for a LONG time (because you continue to give them greater results than anyone else can or will). Exploding your guitar lessons business growth through referrals and word of mouth from your current students. Easily and consistently attracting ‘past’ students to return to guitar lessons with you (even after they quit). Making your business run on autopilot by becoming highly efficient at handling (or delegating) the administrative tasks to have more time for yourself. Maximizing your guitar teaching effectiveness so that your students get faster, broader and deeper RESULTS from you than they can get from any of your competitors! Within the categories above, there are multiple individual steps that, when done consistently (and correctly), will enable you to maximize your success as a guitar teacher in a powerful and predictable way. The time for talking is done. Now you need to decide if becoming a better & more successful guitar teacher is worth $1 to you. If yes, click on the button below, if 'no'… will you tell your students that improving their guitar lessons are not even worth $1 to you? "Is this a trick? Will you charge me $1 now and more later or am I signing up for more payments?" - No. "Why are you selling all this for only $1?… this seems too good to be true." - As you probably know, I have a variety of products and services available to you in order to get you to achieve your other goals and solve your other problems & frustrations that you are likely facing right now. By offering this product to you for $1, I am making a good will offer to earn your trust so that you see first hand that what I have for you in the future is always worth much more than whatever I charge for it. Once you see that for yourself, you will be far more likely to buy more if/when you want to… and if you never buy anything else from me, that's fine too - enjoy this product for $1 (and only $1). Click on the big orange button below that says: "Add to Cart"